Tokyo is fighting a losing battle for Hun Sen’s support, and selling its own legacy in the democratization of Cambodia short. “Cambodia is not mini-China, come [visit],” Sophea said at the Cambodian Investment Forum on March 5. Sophea’s 30-minute speech mentioned everything from special economic zones to Japanese Overseas Development Assistance. But Cambodia’s major crackdown on dissent and its ban on the main opposition party before last year’s election were not on his agenda. When questioned by Human Rights Watch about whether the Cambodian government has concrete strategies to ensure rights protections for the Cambodian people amid a growing number of foreign investments and development projects, Sophea dodged the question. “I’m sorry to say, but we’re in a business seminar,” Sophea said, apparently not concerned that illegal land confiscation for business projects and the abuse of workers are among the country’s biggest rights problems. Japan has been important to Cambodia, for decades its largest aid donor and one of its largest foreign investors. Now, with China surpassing Japan in both areas, the Japanese government appears willing to throw its principles out the window to compete with China for Hun Sen’s affections. Given Hun Sen’s dictatorial and violent record, this is a contest that Japan can’t – and shouldn’t want to — win. Despite Sophea’s denials, in recent years, Hun Sen, who has held power for 34 years, and Chinese President Xi Jinping have been inseparable. They kicked off 2019 by striking a deal involving what Hun Sen described as a Chinese grant of nearly $600 million and a pledge to import 400,000 tons of Cambodian rice. The two agreed on a target of $10 billion in bilateral trade by 2023. The deal was topped off by smaller investments and loans, including an agreement from China to provide a bodyguard compound for Cambodia’s Council of Ministers. This is very worrisome, given that Hun Sen’s bodyguard unit has long been responsible for bloody attacks on the prime minister’s critics, including an infamous 1997 grenade attack on a political demonstration by the then-leader of the opposition, Sam Rainsy. For Xi Jinping and Hun Sen, it was business as usual. Since the 1998 demise of the Khmer Rouge, which China helped propel to power, leading to the deaths of as many as 2 million Cambodians, China has poured billions of dollars into Cambodia in loans, aid, and investments. By 2010, China became Cambodia’s largest foreign donor, though much of its aid is in loans that Cambodia may never be able to repay. In 2018, China accounted for nearly half of Cambodia’s $6 billion foreign debt. Presiding over a one-party state at home, the Chinese government doesn’t have to consider public opinion when supporting dictatorships or account for the expenditure of its funds. It can bribe officials with impunity. Things are different in Japan. This has left Japan in a bind. Despite the worsening climate for human rights in Cambodia, Japan still shies away from open and clear criticism, while continuing to provide large amounts of aid and staging high-level visits, all to charm the deeply unpopular Hun Sen. But Japan is fighting a losing battle for Hun Sen’s support. Japan can’t outspend China or deliver sweetheart contracts to Cambodia, yet its overt and clumsy attempts to ingratiate itself have led to a backlash among Cambodian activists, who see Tokyo selling out democracy and human rights to maintain a friendship with a dictator. Activists see this “values free” Japanese diplomacy contributing to the seemingly irreversible decline of democratic values in Cambodia. That became increasingly apparent in the lead-up to the July 2018 Cambodian national elections. Fearing defeat, the government dissolved the opposition Cambodia National Rescue Party (CNRP), kicked out its members of parliament, and imposed a five-year political ban on 118 of its senior members. Hun Sen also cracked down on independent media outlets, journalists, and independent organizations promoting the rule of law, democracy, and human rights. Hun Sen’s abuse of power evoked strong reactions from dozens of countries, including at the United Nations Human Rights Council. Countries urged the Cambodian government to reinstate the CNRP and all elected members. The European Union in December condemned the dissolution of the CNRP and ended all funding for the 2018 general election, stating that “an electoral process from which the main opposition party has been arbitrarily excluded cannot be seen as legitimate.” Sweden, a longtime donor, announced that it would end its aid to the Cambodian government except for education and research. The United States suspended most aid. Yet Japan broke ranks with the other democracies and stayed largely silent. It provided Cambodia with electoral aid, ballot boxes, and pickup trucks to prepare for what was clearly a sham election. In April 2018, two months after Japan announced its election aid, Japanese Foreign Minister Taro Kono and Cambodia’s Foreign Affairs Minister Prak Sokhonn signed a grant and loan agreement worth more than $90 million. Sadly, Tokyo’s latest actions betray the admirable legacy of Japan in the democratization of Cambodia in the 1990s. Japan was a major player in the 1991 Paris Peace Agreements, which set out the transformation of Cambodia into a democracy and an end to the war with the Khmer Rouge. A Japanese diplomat, Yasushi Akashi, led the UN Transitional Authority in Cambodia, the huge UN peacekeeping and national reconstruction mission. At the cost of many lives, including two Japanese nationals, Japan helped bring about Cambodia’s first democratic election in 1993. Cambodia’s return to a one-party state has prompted Akashi, normally very wary of offering public criticism, and several Japanese academics and experts on Cambodia to publicly call for a system that will “ensure that Japan’s election and legal reform assistance are not utilized to justify heavy-handed governments.” That would involve creating a new Japanese foreign ministry post occupied by an external expert to require that Japan’s Overseas Development Assistance programs promote democratic values. Their recommendations should be heeded. They are also consistent with longstanding Japanese policy. The Japanese Development Cooperation Charter states that “Japan will provide assistance so as to share universal values such as freedom, democracy, respect for basic human rights and the rule of law.” It does not provide an exception for competition with China. The Japanese government should re-emphasize the democratic and human rights values it had once placed at the core of its diplomatic relations with Cambodia. The welfare of the Cambodian people should take precedence over relations with an abusive leader like Hun Sen. Indeed, Japan’s priority should be to join with other democratic governments to pressure Cambodia to meet its international human rights obligations. The European Union has initiated a review of Cambodia under the human rights provisions of its Everything-but-Arms trade benefits program, and the United States is considering invoking the labor rights provisions of its Generalized System of Preferences trade program there. The Japanese government should trigger human rights-based conditionality enshrined in its Overseas Development programs and charter and suspend aid unless Cambodia stops violating those conditions. If Japan wants to have an important role in Cambodia again, it should quickly switch its soft diplomacy approach toward Cambodia to a values-based one. 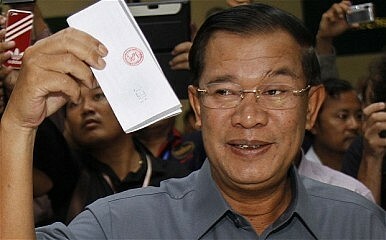 When Hun Sen one day loses power, the Cambodian people will remember who was on their side. Brad Adams is the Human Rights Watch Asia director and Teppei Kasai is the program officer in its Tokyo office.